Oral squamous cell carcinomas are less common in dogs than in cats, but can still appear. Tumors typically arise under the tongue or on the gums but can also affect the tonsils or throat area. Tumor invasion into underlying bone is common. Does My Dog Have an Oral Squamous Cell Carcinoma? Warning signs of this tumor typically involve changes in behavior associated with the mouth area. Paying close attention to the inside of your dog’s mouth during big yawns, as well as noting changes in play and eating habits are the best way to identify potential problems as early as possible. If your dog displays any of these signs or symptoms they could have an oral squamous cell carcinoma, and you should schedule an examination with your primary care veterinarian as soon as possible. Excessive Drooling – Have you noticed that your dog has been drooling more? Have you noticed any blood in their saliva? Difficulty Eating – Have you noticed your dog is eating less because they have difficulty chewing? Halitosis – Do you notice a significant change in the smell of your dog’s breath? Does the bad breath persist even after teeth brushing? Difficulty swallowing or chewing (depending on location) – Is your dog having trouble when trying to drink water, eat, or play with their toys? Weight Loss – Has there been a significant and sudden decrease in your dog’s weight? Loose Teeth – Are your dog’s teeth are loose or falling out? Oral Bleeding – Has your dog had significant episodes of bleeding from the mouth? An oral squamous cell carcinoma diagnosis in your dog can be unexpected and frightening, but there are treatment options available. The best treatment option for you and your dog will be determined by tumor location and size and can be explained in detail by a board-certified specialist in veterinary medicine or radiation oncology. Surgery for oral squamous cell carcinoma in the dog is very difficult because of typical tumor size and location. Recurrence is virtually certain if the entire tumor and all cancer cells cannot be removed. 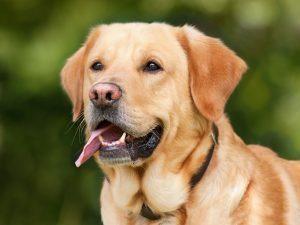 Chemotherapy has been shown to have minimal effects against oral squamous cell carcinomas in dogs but has occasionally been beneficial when combined with other treatment options such as radiation therapy. Palliative therapies such as antibiotics and painkillers can help maintain quality of life but do not slow the progression of the oral tumor. Before the introduction of stereotactic radiation (SRS/SRT) in veterinary medicine, conventionally fractionated radiation therapy (CFRT) was the most common type of radiation prescribed. CFRT can be used alone or follow a surgery to remove oral squamous cell carcinoma where some cancerous cells remain. Shorter treatment protocols consisting of smaller numbers of large doses of radiation, often called “palliative radiation,” may be prescribed for dogs with oral squamous cell carcinoma as well. Both CFRT and conventional palliative radiation can treat in ways that surgery or chemotherapy can’t but there is risk of damaging normal, healthy tissue that surrounds the tumor because of low precision. There are also multiple anesthetic events and prolonged courses of treatment with CFRT. Many dogs undergoing CFRT or palliative radiation for oral squamous cell carcinoma are reluctant to eat on their own and require feeding tubes. As with any cancer, the earlier a canine oral squamous cell carcinoma is diagnosed and treated, the more likely it is that treatment will provide benefit. If your pet has been diagnosed with cancer, contact our Pet Advocates at (833) PET-HERO or your local PetCure Oncology center. Our team members are ready to help answer your questions.